Since we got pretty much all of the world building out of the way in the first book, we are much more comfortable in this book. The terminology is now comfortable and understanding how this world works comes much easier to the reader. This time around the magic is up more than tech, and the magically forces are going a bit nuts due to the impending flare (a time when the tech fails and magic is more powerful than ever). Kate is feeling all of the raw power, but she doesn’t have time to revel in it. People are disappearing and there is this strange bowman that keeps on stealing from the Pack. Our bowman, while his intensions are not very clear, is he friend or foe, he is actually quite charming and I find myself liking him despite we don’t know whose team he is playing on. Kate is her typical fierce self, she is settling into her new job, and somehow she has stumbled into something huge, could even involve vengeful gods. On top of missing people and a bowman popping in and out of her life, Kate now finds herself responsible for a young girl. Her mother is one of the missing people and Kate has been tasked with finding her. To defeat this mysterious foe and find the missing people Kate is going to need some help and it comes in the form of the shifters. So we get some more tension between Kate and Curran, plus our Derek and Jim fixes! As with the first book, we find ourselves in a whole lot of action. Kate is on a whole other level with Atlanta steeped in magic, she is more powerful than she has ever been before and she is going to need all of it, to fight what is coming. What I have also come to enjoy about this series on top of the action and Kate fierce self is the mythology. 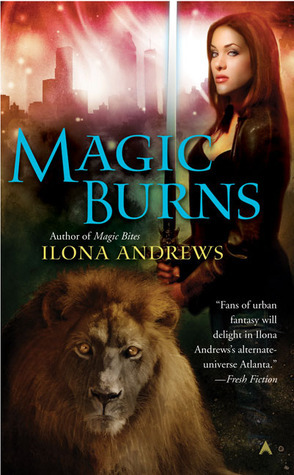 Ilona Andrews pulls in a lot of mythology from all sorts of cultures into this series. In this book it is Celtic Mythology. I have always enjoyed mythology, so I am happy that it finds its way into this series. It’s not so much that it is like reading a mythology text book, but just enough that it is entertaining on top of a tiny bit educational. What I also like about the series is each book has a new villain to slay. So, the villain in this book is completely different from the first book. I get annoyed when we are fighting the same villain book after book. So I don’t have to worry about getting bored with this series! This book is more of what I was expecting when I picked up this series. It was a great, action packed, and entertaining read! I can’t wait for the next installment!